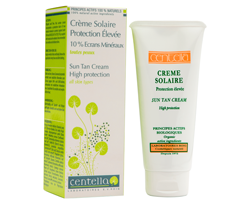 This sunscreen soothes and moisturises without leaving your skin clogged. A light weight reflecting sunscreen for physical UV block, which protects the skin against premature ageing, sun damage and sunburn. The sunscreen must be re-applied every hour. This is the most incredible sunscreen that I’ve ever used. I have very fair skin and burn really easily. I’ve never been sunburnt whilst I’ve had this product on though. I couldn’t recommend it highly enough. Thank you for taking the time out to let us know!